Three South Winn matmen are one step closer to earning a spot at the state wrestling meet. At Saturday’s Class 1A Sectional 2 meet in Monona, two freshmen and a junior finished in the top-two of their weight classes to move on to the district meet Saturday, Feb. 9, in Denver. Earning runner-up finishes to advance were Ethan Maldonado (freshman, 106 pounds), Philip French (freshman, 113 pounds) and junior Logan Schnuelle (152 pounds). As a team, South Winn placed fifth with 120 points. Denver was the team champion, compiling 278.5 points. MFL MarMac was second with 186 points. The top-two teams (Denver and MFL MarMac) advance to the regional team tournament today, Tuesday, Feb. 5. There were seven teams at the Sectional 2 meet. Grapplers needed to finish in the top-two of their weight bracket in order to advance to districts. Maldonado placed second at the sectional meet Saturday to earn a spot at districts. The freshman started his day with a quarterfinal bye at 106 pounds. He then went up against Cael Judisch of Sumner-Fredericksburg, throwing the Cougar in 3:50 in the semifinals. That put him in the finals against Joe Ebaugh of Denver, falling on a 4-2 decision. In a wrestle back match, the SW 106-pounder pinned Postville’s Riley Rankin in 5:55 to earn second. With a 32-8 season record, Maldondo will face Rockford’s Kaden Peterson (26-13) in the first round Saturday. Also a freshman, French claimed runner-up at 113 pounds, utilizing a first-round bye. The youngster toppled Sumner-Fredericksburg’s Brady Wilkinson in 53 seconds to advance to the finals against Class 1A No. 6 Brooks Meyer of Denver. French was thrown in 26 seconds to finish second. So far, French is 31-10 this year. He will do battle with Class 1A No. 3 Jakob Whitinger (40-2) of Nashua-Plainfield at districts. A year ago, Schnuelle’s sophomore season ended at the district meet and he is looking for redemption. It was a wrestle back victory for Schnuelle at 152 pounds, allowing him to finish second. Following a bye, Schnuelle took on Denver’s Ben Foelske, winning by a 5-3 decision. Next on the list was Class 1A No. 1 Kaleb Krall of Wapsie Valley. Schnuelle put up a fight against the top-ranked Class 1A wrestler before being thrown in 3:20. Luckily for Schnuelle, he got a second chance with a wrestle back. Facing MFL MarMac’s Max Havlicek, Schnuelle won by fall in 1:16. At 34-8 this year, Schnuelle will face off with Brody Roder (28-16) of AGWSR in the first round of district action. The district meet is Saturday, Feb. 9, at noon in Denver. Champions and runners-up from the MFL MarMac and North Butler-Clarksville sectional sites do battle at districts. The top-two grapplers at each weight class advance to the state meet, which runs Thursday through Saturday, Feb. 14-16, at Wells Fargo Arena in Des Moines. 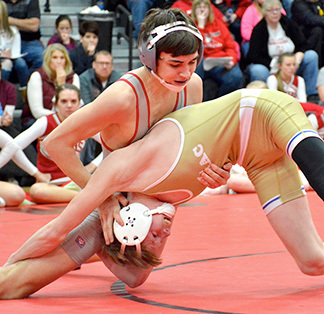 Last year, South Winn had nine grapplers move on to districts. Schnuelle will be the lone matman with district experience.